I have known OS for many years. We were students together when I was doing my first degree, but only really got to know each other when both driving taxis out of the Newtown depot in the mid-eighties. Everyone is unusual (cue: You’re all individuals!). In OS’s case, that has quite a lot to do with the (in his case) scarring effects of his cradle-Catholicism. I think he’s cast off the specific doctrines, but the imprint is still deep. For some reason today our conversation turned to the upcoming election. OS explained to me that every Federal election was for him a source of anguish as he couldn’t possibly vote for Tanya Plibersek (his local member) unless she divorced that terrible man she was married to. He explained to me further. MC-T came from a privileged, conscientious background (OS, too, was educated by the Jesuits though at their less grand Sydney school) and yet he became a heroin dealer. I tried again with the line that users often become dealers because of their addiction. I didn’t bother with broader arguments about the stupidity of the war on drugs and the illicit trade it fosters. That means I didn’t get to suggesting to OS that MC-T, notwithstanding his many advantages in life, might have been a victim. I even tried the line that given that he had been punished it wasn’t a question of whether his conduct was inexcusable. That won’t have changed his mind. On a Friday early in May to hear the SSO, conducted by Oleg Caetani. The headline item was Shostakovich’s Leningrad Symphony. The first half featured young Armenian cellist, Narek Hakhnazaryan, playing the Tchaikovsky Roccoco Variations and a specifically commissioned companion piece by Paul Stanhope, Dawn and Darkness. Perhaps inevitably, Hakhnazaryan made a stronger impression in the Tchaikovsky (it’s core repertoire after all) than the Stanhope, and he made an even stronger impression in his striking encore, Lamentatio by the Italian cellist and composer, Sollima, in which he not only played but sang. As with other young touring artists from the post-1989 eastern edge of Europe, Hakhnazaryan attracted noticeable band of compatriots. Somewhere on the internet this piece is described as a lament for the Armenian genocide – though I’ve not found a spot where this is mentioned independent of NH’s performance. I’m not sure if the Armenian contingent would have been quite as ready to cheer the Leningrad Symphony and there was a bit of restlessness from time to time. I’m naturally a bit suspicious of all of those pictures of Shostakovich wearing a fireman’s hat or wielding a hose, and it might be remarked that he finished the symphony after being evacuated to Moscow. I think you can nevertheless accept the first movement as genuinely programmatic about emerging senselessness of war – the duality in it is a bit like the (historically parallel) peace and war in Prokofiev’s War and Peace. Part of the idea, in each case, is that the 1941 war snuck up on a peaceful Russia. Even before Volkov-Shostakovich issues are considered, there must be a bit of a shadow in the latter integer of that idea – that is, “peaceful Russia.” You also get a version of this idea in the 2010 film Fortress Brest/Fortress of War. This starts with a positively idyllic depiction of life in that fortress, which all comes to a terrible end following the surprise attack on the Soviet Union by the Germans. It’s all a bit like the first movement of the Leningrad. What the film leaves out is that Brest, site of the signing of the infamous Treaty of Brest-Litovsk in 1918, was part of Poland until it was captured by the Germans in 1939 and handed over to the Soviet Union later that year in accordance with the prior German-Soviet pact for the division of Poland. So it’s all a matter of perspective, really. But back to the symphony and that famous tune and its Bolero-esque treatment. Whether Bartok and Shostakovich were both guying Lehar’s “Da geh’ ich zu Maxim” or whether Bartok was having a go at Shostakovich remains a bit up in the air. I didn’t feel any need to resolve this question. It was kind of (if mindless) fun to go with the flow as the little tune grew bigger and bigger and the counter-riffs more and more grotesque. The second movement continued the pastoral feel with some lovely woodwind solos over hints of Shostakovich’s William-Tell/Drunken sailor rhythms with a manic waltz in the middle. Some of the yearning and eventual affirmation in the last two movements seems less specifically programatic, though of course audiences at the time are likely to have been receptive to the declared program. In 1942 and even 1943, when the work had wide exposure, the prospect of victory was still remote. Maybe it’s only with hindsight that one can suggest, as Paul Stanhope did, that it would benefit from about 20 minutes’ worth of cuts, though I confess a similar thought crossed my mind. Still, monumentalism has its own impact, and I certainly enjoyed it. Caetani is always welcome here, so far as I’m concerned. His program biography still effaces any mention of his time at the Melbourne Symphony Orchestra, summarily cut short in 2009. If your Russian is up to scratch, maybe you might learn more from his interview given to SBS during his visit. The summary includes: “Former Artistic Director and Chief conductor of MSO speaks openly about his shocking dismissal in 2009 and uncompromising musical principles he has always followed. ” The headline is: “Maestro Caetani returns to Sydney but says NO to Melbourne.” I for one wouldn’t blame him for saying “NO” in the circumstances, though it would be surprising if Melbourne has had the temerity actually to ask. Broadcast of concert online for a few more days here. On Saturday 14 May to UNSW with P and her son T to hear the Australia Ensemble. For the second time this year, there was a large flock of corellas roosting in the big gum trees at the front of the John Clancy Auditorium. The Strauss (Richard) was said to be a Brahmsian work. I suppose compared to where Strauss went afterwards it was, though I didn’t hear all that much Brahms until the third movement and the busy beginning to the finale. There were unmistakeable signs of the future Strauss starting from the Heldenleben-ish big tune in the first movement and right up to the characteristic (think Till Eulenspiegel, or the boy coming back for the hanky at the end of Der Rosenkavalier) playful curlicues. The Ball was a commission, originally for Catherine McCorkill, who sadly is no longer billed as part of the ensemble. The “Pulse” in the title clearly refers to rhythm rather than legumes. It was given a rousing rendition by David Griffiths, still listed as a mere associate artist. And, of course (though less rousingly) Ian Munro at the keyboard. The Mendelssohn is of course a wonder, though not quite the marvel it is often touted to be (on account of his extreme youth when he wrote it) because the version we hear was polished up by him a few years later. The string members of the ensemble were joined by the Tin Alley Quartet. The octet is such a well-known work that I found it almost nerve-wracking to witness, especially in the big first movement which really gave Dene Olding a work-out (as does the whole thing really). I should lighten up. The second movement (the least well-known) was a relief by comparison. I have let too much time pass to make any very meaningful comment about the Milhaud. P is often critical of some wind ensemble music, but I find myself nearly always beguiled by the sheer sound of the wind instruments playing together (or, in this case, with the piano as well). I think it is because instruments supported by breath are so much like the voice. The music is almost irrelevant to this. From memory I liked the first and last movements the most, though the explosive third movement was pretty exciting. In the last movement, I noticed the oboist, Huw Jones, sticking something up the bell of the instrument when he was playing some low and quiet notes. A few bars later he took it out and almost surreptitiously stuck it back in his pocket. I guessed it was some kind of mute – it is difficult to play the oboe low and quiet and it has a propensity to quack a bit. At interval, I ran into Jones. When I asked him about the mute he pulled it from his pocket where it still was: a packet of Tally-ho cigarette papers. You often see woodwind players doing something with cigarette papers mid-performance and especially oboists, when they are not (as they also often are) fiddling with their reeds. Internet “researches” suggest that they are drying the pads. Some woodwind supply shops actually sell cigarette papers. Jones told me that there were cloth mutes that people sometimes used but the Tally-ho pack was just the right size. I’m guessing it is probably also convenient if you are going to have the packet with you anyway on account of the other uses for the papers. What will oboists do in the not-so-distant day when all smoking is forbidden and smoking paraphernalia are no longer so widely distributed? It could be a bit like the problem which is already emerging in relation to the million-and-one home uses for newsprint. That’s what the original Inspector Barnaby in Midsomer Murders frequently said to witnesses or suspects. Given the main way of being eliminated as a suspect in Midsomer, you have to wonder why anyone obeyed him. Christopher Sharkey and Donya Nissi met in 2003 or 2004. Sharkey, 20/21, was an internet whizzkid. Nissi was just finishing or had just finished school. They moved to Orange where Nissi went for her university studies. At this time Sharkey’s business, Ozstays or Stayz (if there is a distinction I’m not sure what it is) was already doing quite well. In December 2004 they became engaged at a concert by “The Whitlams” in Newtown. Spectacularly, Sharkey set the proposal up by arranging for the lead singer, Tim Freedman, to sing “The Lady in Red” (or a fragment of it, anyway) and announce that “this is for Donya from Chris” before he popped the question. He had told Freedman that this was Donya’s favourite romantic music. In 2005 they bought a house at [MM] Denison Road Camperdown in both their names. Sharkey provided the cash for this, or most of it. At the beginning of 2006, Sharkey (by now 23/24) and his business partner sold their interest in the Stayz business for $12.7 million. Sharkey received half of this. He used some of that to pay of the mortgage on [MM] Denison Road. He also gave substantial presents to his father and to Nissi’s parents to pay off their home loans. In late 2007, Sharkey and Nissi bought the neighbouring property to No [MM], being [NN]Denison Road. Sharkey paid for this. Sharkey said that the property was put in Nissi’s name to protect it from claims that might be made against him. Almost immediately after that, Sharkey decided he wanted to raise money for his business ventures and investments. He set up a family trust which borrowed money for which both No [MM] and No [NN] were given as security. In 2011 Sharkey wanted to raise more money for his business ventures. He proposed selling No [MM] for this purpose. In March they reached an agreement (recorded in writing). Sharkey or the Trust would would not contest the ownership of No [NN] and would make no more loans against it and repay the loans then secured against it by the end of 2012. Nissi agreed that the entire proceeds of sale of No [MM] would go to Sharkey. Later that year Sharkey went to America where he worked with his brothers on their internet ventures. Sharkey or the Trust did not repay the monies secured against No [NN] by the end of 2012, and stopped making payments on the mortgage at the end of 2012. In 2013, after demands from the bank, Nissi refinanced the debt and rented the property out, presumably in order to meet the mortgage. Sharkey commenced proceedings that in truth No [NN] was his and Nissi should convey the property to him; Nissi cross-claimed for performance of the March 2011 agreement (so far as Sharkey had agreed not to contest the ownership of No [NN]) and damages for its breach (so far as she had been put to expense to repay the mortgage when he did not). The matter came on for hearing in February 2015 before Justice Robb. Most of the facts above come from his judgment, finally handed down in September 2015. Some of them may be a bit inaccurate because judges often don’t get every detail right and if such details don’t make a difference to the outcome or the matter is ultimately resolved they will stand uncorrected. To save any suspense, I should add that Nissi was successful, though the amount of damages is yet to be assessed, mostly it seems because Nissi was unsuccessful in tendering in the course of the trial some of documentation proving components of her damages claim . That just shows how hard-fought the trial must have been, because in fact the damages will presumably could well be continuing by reason of any interest on the mortgage debt that Nissi is probably still paying. But maybe Sharkey, who is now in America, doesn’t really care all that much. Which is what Nissi was worried about last February. If she won, she would be secure in her ownership of No [NN], but how would she get the money part of her claim? Sharkey was now living in the USA. Perhaps he had put his assets in the name of his new partner, as he said he had done with Nissi, to make himself proof against judgment. When the hearing started, he gave evidence that he had negligible assets in Australia. And in the opening by his counsel, some remark had been made about the witnesses returning to the USA as soon as they had given their evidence. Nissi’s team jumped into action. They engaged separate counsel, John Hyde. On 18 February he went off to a different judge (the duty judge, Justice MacDougall) while the trial before Robb J was still going on and obtained an ex parte injunction preventing Sharkey from leaving the country. Ex parte means they went before Justice MacDougall without forewarning Sharkey. You can make ex parte applications when the nature of the order is such that if the other side knows you are going to seek the order (which is usually to stop them doing something) they might just go and do it before you can get the order, in which case it will be too late. Such orders are always made in a way which brings the matter back to the court shortly after for the person bound by the order to have a chance to say why it should be discharged or should not have been made in the first place. There is a duty when making an ex parte order to disclose all relevant circumstances to the court. If you haven’t, that is the first ground on which the other side is entitled to have it discharged. The problem for Nissi was that what was said by Sharkey’s counsel about Sharkey’s witnesses leaving immediately had been misinterpreted. On a fair interpretation, and in the light of previous correspondence, it was clearly only a reference to witnesses other than Sharkey. John Hyde told MacDougall that Sharkey too proposed to depart precipitately. Justice MacDougall made the orders at about 11.40am. The orders required Sharkey to deliver up his passport to the Court. They also provided for the matter to come back before him at 2pm. This would normally be the point at which Sharkey would have his first opportunity to argue against the orders. Pursuant to leave granted by MacDougall J, the orders were served on Sharkey in the precincts of the court during the morning-tea adjournment of the trial before Justice Robb. It must have been a bombshell. Sharkey’s side had just completed their case. The matter had to be raised with Justice Robb because of the listing before Justice MacDougall at 2pm. In correspondence over lunch Sharkey’s lawyers complained about the ex parte application and whether all relevant matters had been disclosed. They even asked Nissi’s lawyers if they had disclosed to MacDougall J that Sharkey’s wife is more than six months’ pregnant and was also looking after a 10 month old child on her own. Feelings were running high. The matter shuttled backwards and forwards between MacDougall J and Robb J over the next day or so. Robb J was reluctant to deal with an application to set aside an order made by MacDougall J. There was also the question of the time available before Robb J to complete the substantive hearing, from which arguments over the ex parte orders would obviously be a distraction. Whilst Nissi had a separate barrister engaged, Sharkey did not. Ultimately, the further consideration of the ex parte order was heard by MacDougall J on 25 February 2015. His Honour set it aside on the basis of material non-disclosure. Even then, transcript was not available of the 18 February ex parte hearing. Once the transcript was available, John Hyde wrote to the judge and the other side apologizing for statements he made about what he had said on the 18th which proved to be incorrect. Just a bit ironically, given that his application to set aside the injunction was based on a misrepresentation to the court by Hyde concerning statements made on Sharkey’s behalf leading to an inference that Sharkey was planning to flee the jurisdiction, Sharkey did in fact leave Australia for the USA on the evening of the day the injunction was set aside – though he was held up at immigration because the court order had not yet been taken off the books. He eventually made his (delayed) flight but his luggage did not catch up with him for about 30 days. This shows the strictness of the rule that an ex parte order will be discharged if there is a material misrepresentation. The order was discharged even though the risk to Nissi of getting no money from Sharkey if she succeeded existed whether Sharkey left the jurisdiction immediately after giving evidence or at any time before he paid her what he might be found to owe or provided security for that amount. Then again, you might think it a tall order to require Sharkey to remain in the country until then. Potential judgment creditors are usually only entitled to what was originally called a Mareva order preventing the dissipation or concealment of assets if it can be shown that there are such assets and there is reason to believe they will be secreted away in order to render the judgment futile. Justice Robb delivered judgment in Nissi’s favour in September 2015, but the question of the amount of her damages was deferred to a further hearing. In February 2016 Sharkey filed a notice of motion seeking orders from the court that Mr Hyde and Ms Nissi’s solicitors, EMC, no longer be permitted to act for her. In submissions for that application, Peter King (Malcolm Turnbull’s predecessor as member for Wentworth) repeated many of the accusations made by Bransgroves, albeit in more temperate terms. Once lawyers’ personal interests are involved the forensic temperature always rises. Classically, you see that in arguments about costs, where the argument (personal costs orders aside) is about loss of face and which side’s lawyers are going to have to get their clients to pay their fees and maybe also the other side’s. This is all the more so when allegations of professional impropriety are made – if only because then it is likely that Hyde’s and the solicitors’ professional liability insurance policies were enlivened. Even though it was unlikely that Mr Hyde would have any ongoing involvement in the case, he could hardly be expected for that reason to acquiesce in such a judgment on his conduct. The hearing of the notice of motion was a veritable festival of silk on the respondents’ side. In the course of the hearing, before Justice Kunc, Peter King eventually resiled from the more florid accusations of professional misconduct, or at least no longer relied on them. His Honour held, consistent with Macdougall J’s decision (and with the observations quoted above), that the mistake about whether Sharkey was planning to “abscond” immediately after giving his evidence was an understandable misunderstanding. Sharkey’s application was dismissed. Sharkey had applied for orders preventing not only the individual solicitors involved within EMC but also the entire firm be restrained from acting for Nissi. Kunc J held that there was no basis for the application other than against the two partners involved so that the remaining partners were entitled to have Sharkey’s notice of motion summarily dismissed against them. That’s over and above the fact that the application was eventually dismissed against the two partners involved. The costs consequences for Sharkey of bringing an application with no basis (and at a time when the two partners who had been involved had undertaken or offered no longer to be involved) have yet to be determined. Rather quaintly, the order preventing Mr Sharkey from leaving was described as an order in the nature of ne exeat colonia. That’s a local adaptation of a historical English order ne exeat regna. I speculated above that maybe Mr Sharkey, now in America and with negligible assets in Australia, doesn’t care all that much about the damages claim. Subsequently, Ms Nissi sought to amend her cross claim to include a claim for indemnity from the Trustee of the trust on the basis that, as a guarantor, she had repaid debts owed by it. I’m guessing this is because the Trust has assets which are amenable to enforcement even if Mr Sharkey does not (again the whole ne exeat problem). Ms Nissi had made a claim to be subrogated, described as “misconceived” and dismissed. I can’t be bothered to rake through the facts to work out the misconception unless it is simply that it was back to front. Robb J refused the amendment because it was too late and because, unless further evidence were to be led, consistent with his reasons to date it was doomed. Robb seems to have taken the view (at ) that someone has blundered on Ms Nissi’s side. Always an easy conclusion to reach in hindsight. Sydenham Station sits at the bottom of Marrickville. When I lived at Dulwich Hill I sometimes caught the train there because of the quick and frequent service on the Eastern Suburbs line and even more often caught the train back there in the evening when services on the Bankstown line became (even) less frequent. 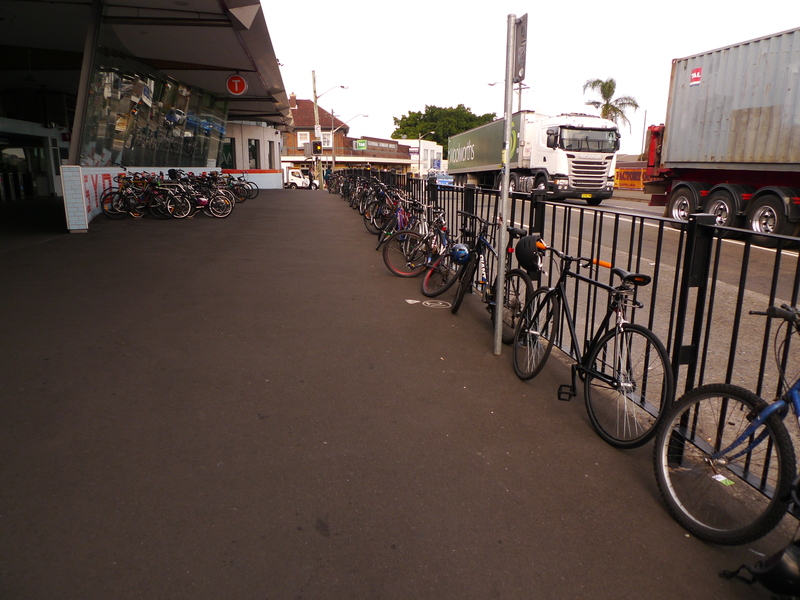 On the footpath approaching the station there were a few stands for tethering bicycles and always a few bicycles there. Only a few and mostly rather broken-down looking: it always struck me as a pretty perilous place to leave a bike. Over about a year and a half from 2011 to 2013, Sydenham Station had an extensive upgrade. By the time it was finished I had moved to Ashfield, and it’s only recently I’ve found myself back there to catch a train. New “bike storage facilities” were part of the upgrade, as you can see. In what the designers probably considered a magnificent and enlightened gesture, far more “facilities” were provided than I ever saw bikes there. Last night to hear the SSO, conducted by Masaaki Suzuki, well known from recordings by Japan’s Bach Collegium, perform Haydn’s Creation with soloists and the Sydney Philharmonia. A portion of the SSO’s subscriber base chooses to stay away if a vocal work is featured. This is not always made up for by a compensatory influx of choral and vocal enthusiasts. Clive Paget in his review of Wednesday’s performance described attendance as sparse. I wouldn’t say it was sparse on Friday but it was a bit patchy, especially at the edges. Which is a pity, because there was much to enjoy. The time has come where orchestras, playing on “modern” instruments, can really respond to direction which is inspired by “HIP” (Historically Informed Performance). That’s mostly a question of the string section and vibrato and bowing, but I also particularly admired the playing of guest wind principals, notably Irit Silver on clarinet from Queensland (could this be a tryout?) and especially Andrew Nicholson, flautist from WASO. How many years is it since we heard a male flautist in the SSO? Perhaps my neighbour in the first half was a non-enthusiast who should have stayed away. She yawned, she fidgeted with her program and flicked backwards and forwards through it. Did she not know how it ended? I am my own worst enemy when next to such a person. At interval I moved to get away from her. As it turned out, quite possibly to get away from me, she went home. The oratorio follows the Genesis narrative, via Milton. One peculiarity of this (which I can’t say I’ve ever really thought about before) is the order of creation of animals: first birds, then creatures of the sea, and finally of land. Insects, including flying ones, came in the final category. Part III, short and sweet after interval, featured Adam and Eve in the Garden of Eden. It’s hard not to think that more than a bit of this owes something to Milton’s unhappy first marriage, as Eve proclaimed her delight and sole purpose in obeying and serving Adam. Lydia Teuscher didn’t even pretend to sing this with a straight face. It was left to Allan Clayton (a striking presence, a kind of youthful shaggy prophet on smoko) as Uriel to warn, deadpan, of the perils to come. On Tuesday with D and my sisters, YY and KR, to the Sydney Conservatorium for what was described on the night as the first concert of the Verbrugghen Ensemble – that is, their first regular concert after inaugural lunch-time performance last October. The concert is to be broadcast this afternoon at 5pm. This was the first time YY had been back to the Con since, rushing out into the real world of actual gigs, she abandoned the Jazz diploma course in about 1978. Unsurprisingly, she remarked on the comparison between the dusty old main hall and the shiny new Verbrugghen. It was a bit more of a wrench to find that the fish-ponded courtyard and old Con High were no more. The ensemble was announced last year by the Con as a “resident ensemble.” What we got at the concert wasn’t quite what was on the original label. There were a few substitutions of artists including a double-bassist who didn’t even make it onto the printed program. My heart sank just a little when a person who identified herself as the Acting Dean stepped up to the onstage microphone at the start for a little speech acknowledging the Gadigal and Eora people and giving a spiel about the ensemble as a successor to the 1916 Sydney String Quartet and the ensemble’s plans to be a presence in Sydney musical scene. I guess most of the audience, being Con staff and students, were ready for this, but to me as an outsider it detracted from what was surely otherwise intended to be a grown-up concert. With the Australia Ensemble and the Omega Ensemble, the Verbrugghen makes three nominate mixed ensembles in Sydney. For what it is worth, I was more impressed by the Australia Ensemble’s performance of Appalachian Spring (now almost 8 years ago!) than the Verbrugghen’s, but thought the Verbrugghen’s version of the Mahler more successful than last year’s version of that by the Omega (though not in all respects). My sisters and D were not troubled by any such comparisons. I was pleasantly surprised at how much they all said they enjoyed the concert, even if KR (who rarely gets to classical concerts – the last probably being when she came to the Australia Ensemble with me in 2013) confessed to dosing off a little in the slow movement of the Mahler. She’d had a lot on. The chamber arrangement of the Mahler is particularly successful on its own terms in the last song movement, and also when the violins engaged in more soloistic stylisation than you might get (the scordatura part aside) in a symphonic performance. Maybe balance was different elsewhere in the hall but my elder sister and I agreed that we would have preferred the piano lid to be open even a little and in the Mahler to have heard a bit more of the harmonium which often has to stand in for the whole brass section. We would have liked to stay for the meet-the-ensemble opportunity after the concert, if only so that YY could have had a little high school reunion with Phillip Shovk, but an early-closing kitchen (it was a Tuesday night after all) meant we had to scramble into a cab. You are currently browsing the Stumbling on melons blog archives for May, 2016.